i just realized that my post from two weeks ago was my 100th post for this blog. w00t. thanks to everyone who has ever stumbled across this blog in the two years and four months it’s been up. by far the most popular post has long been the one with the scan of a super mario shampoo magazine ad which apparently seems to show up on a lot of general image searches for “super mario”. who can even begin to guess the cosmic powers at work here (or rather, at google)? 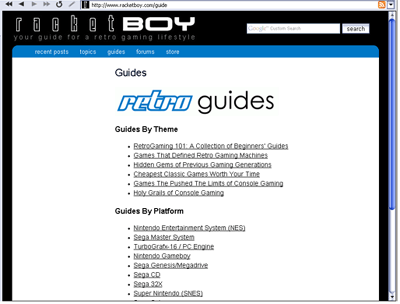 Retro Gaming 101: Learn essential information about vintage consoles. Defining Games: Discover the games that gave each machine its personality. Hidden Gems: Explore the best games that usually go unnoticed. Cheapest Games: Collect the best games without spending much money. Holy Grails: Discover the rarest and more valuable games of all time. i’m still working my way through the video game canon, but the lists on racketboy have proven to be well worth perusing. i prob. spend more of my time reading the “hidden gems” sections since most of the games in other sites’ top 10 or top 100 lists are so well known and don’t vary much from site to site. the site also has some other great features. one is together retro, a sort of video game “book” club. basically racketboy chooses a retro game for everyone in the group to play for a week or more, depending on the game, allowing participants to compare scores, share tips, debate, and discuss. my list of games to play is already so long that i haven’t really had any chance to participate in the club, but i keep my eye on the selections and it’s great to read through the accompanying posts in the together retro section of the site’s forum. another feature i enjoy is the “The Most Stunning Artwork” series in which racketboy highlights great fan art from various series. so what’re ya waitin’ for? check it out!